Bring animals from the farm, countryside and wood to life with the magic of feltcraft. Wool is a wonderfully natural and tactile material for crafting. This beautifully presented book guides readers through the creation of their own three-dimensional felt creatures from raw wool batting, using Rotraud Reinhard's unique 'building-up' method. 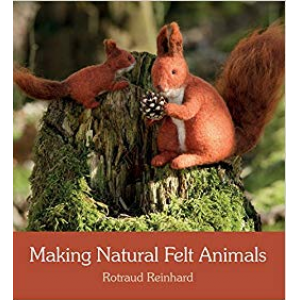 From lazy cats to jumping squirrels, tiny mice to majestic deer, this richly illustrated book offers step-by-step instructions for more than 25 different animals, many of which can be made in several stances and sizes to fit different nature scenes. The book also provides options for designing individual fur markings and details. As individual animals or in a seasonal tableau, these natural-looking animals will enrich any home or classroom. DIMENSIONS: 23 X 21 X 1 cm, 150 pages.